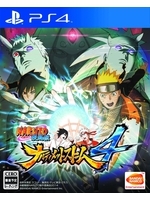 Bandai Namco has released the New York Comic Con trailer of Naruto Shippuden: Ultimate Ninja Storm 4. It showcases Itachi Uchiha and Shisui Uchiha awakening into their Perfect Form Susano’o that have been designed by the creator of the NARUTO series, Masashi Kishimoto. The game will be out in February 9th in North America, February 5th in Europe. What about the last game? It looked pretty modern.